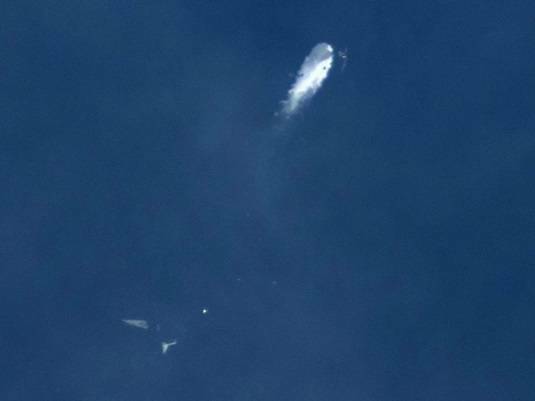 Both Virgin Galactic and Scaled Composites have vowed to continue the private exploration of space after Friday's crash that destroyed SpaceShipTwo, claimed the life of one pilot, and severely wounded another. "Space is hard, and today was a tough day. We are going to be supporting the investigation as we figure out what happened today, and we’re going to get through it," said Virgin Galactic chief exec George Whitesides at a press conference at the Mojave Air and Space Port. "We believe we owe it to the folks who were flying these vehicles as well as the folks who have been working so hard on them, to understand this and to move forward, which is what we’ll do." 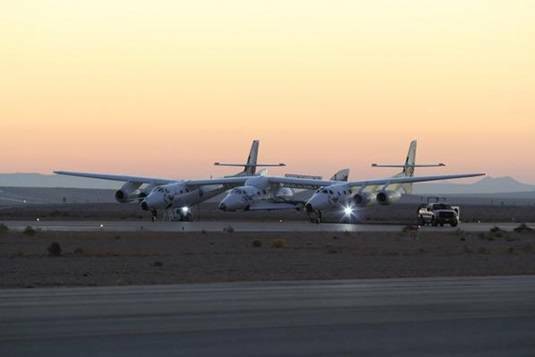 Stuart Witt, chief executive of the spaceport, said that the WhiteKnightTwo aircraft carrying SpaceShipTwo took off at around 9:20am PT and reached its test altitude 50 minutes later. 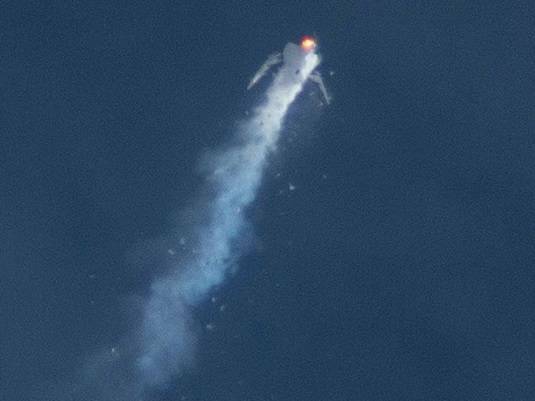 At 10:10am, SpaceShipTwo was released and after the expected delay, the rocket fired. Witt, who was watching the craft from the base of the control tower, said that he saw nothing wrong at first and the rocket appeared to be firing normally. He said he saw no explosion and it was only at 10:12am when "other things weren't happening," that he realized there was a problem. Pictures from a freelance photographer the ground appear to show a slightly different story, albeit from an alternative physical location. 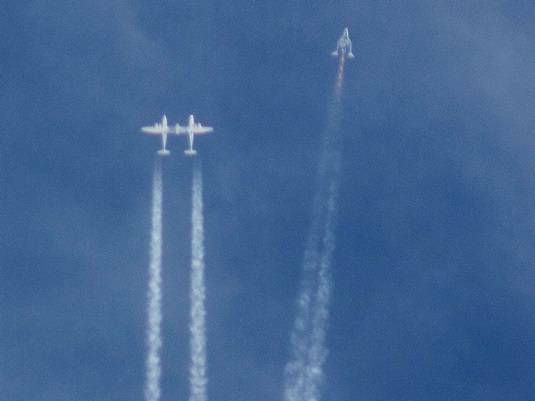 SpaceShipTwo separates from WhiteKnightTwo and fires its rocket as normal. Credit: Kenneth Brown/AP. What looks like an explosion and the breakup begins. Credit: Kenneth Brown/AP. Witt declined to comment on whether there was any conversation with the crew in those crucial two minutes. A chase plane was following SpaceShipTwo, but Witt also declined to give any information as to what its pilot saw of the event. "The test community is very small, and we are human, and it hurts," Witt said. "Our hearts, thoughts, and prayers are with families of victims at this time." As soon as ground control realized there was a problem the spaceport's emergency plan was activated. Both the local fire department and the spaceport had helicopters in the air for the test, and the local sheriff's department had a car on the ground, which found the wreckage 25 miles north of the spaceport. "We flew around the crash site, it's a large area and the aircraft is in several pieces," said Sherriff Donnie Youngblood. "We found one person who had obviously deceased immediately. The other person had what appeared to be major injuries; I don’t know what that means yet, but our hopes and prayers are with the families." Eyewitness reports say that the dead pilot was found still strapped into his seat. It is thought his copilot managed to eject from the aircraft. The injured pilot was flown immediately to hospital and his condition is described as serious. The families of both pilots have been informed of the news, although the pilot's names have not been released as yet. The crash site is now being secured and mapped out, and officials from the Federal Aviation Administration and the National Transportation Safety Board are on the way. Richard Branson is also flying in and is expected at the spaceport tomorrow. According to Kevin Mickey, president of Scaled Composites, the type of rocket used by SpaceShipTwo had been flown three times before and had been extensively tested on the ground as well. For this flight it was using "a small nuance to the rocket motor's design." SpaceShipTwo was totally destroyed in the incident, and as it was Virgin Galactic's only spacecraft, the firm will now be facing serious delays before it can consider taking passengers up. Quite how many of the celebrities who signed up for a ride will still be interested in making the trip remains in question.